I don’t think I ever tried a piece of the lemon meringue pie that they used to serve in my school canteen, but it sticks in my memory because of its frankly alarming neon-yellow colouring. I watched friends manipulate chunks of this rubbery, radioactive stuff around their plates, reminiscent more of glow-in-the-dark wallpaper paste than of anything that was once rooted in the earth. I was oddly fascinated by it, the way its jelloid luminescence was able to support a crest of snowy meringue, the way it resembled that fluorescent putty you give children to play with. Its presence on a plate seemed somehow outrageous. Too yellow. Too lurid. Many, many years later, I watch my mother remove a jar of the same eye-poppingly bright stuff from the larder. This time there is no meringue or pastry involved, only a jar of Sainsburys’ basics lemon curd that my brother had apparently purchased, sampled, and forgotten about. It had cultivated a variety of slate-blue moulds on its slick surface, populating the contours of the canary-yellow curd which still remained shockingly, radioactively yellow-green. There was something strange about that contrast, the fact that even a foodstuff whose colour so obviously screamed ‘artifice’, ‘chemicals’, ‘processing’, could still support a flourishing colony of mould. I’m not sure any lemons were harmed in the making of that ‘lemon’ curd. Certainly, if they were, their natural colour was supplemented with the addition of one beginning with E.
Rummaging further into the Narnia-esque treasure trove that is my parents’ larder, I unearthed another jar of lemon curd. Its rich, yolk-coloured yellow, slightly milky without a hint of neon in sight, suggested that it may at some point have seen the inside of a citrus fruit. There was no mould; just a jar of silky, buttery, tangy lemon spread. While lemon curd is ambrosial simply smothered on top of warm, toasted carbohydrates, one of my favourite ways to use it is to roll it up inside an enriched dough, cinnamon roll style, with a smattering of blueberries that burst in the heat of the oven and bleed into the buttery, molten curd, staining the crumb a delightful bright purple. If you’re a fan of that luscious crossover point between sweet and sour, particularly when softened by a generous amount of butter, this is the recipe you need. It’s based on a traditional Danish kanelstang, which is essentially a cinnamon bun loaf. The dough is traditionally filled with vanilla cream and a cinnamon and sugar filling, then sliced so as to open up the sides into bun-like shapes. This is a much easier version, where the dough is simply spread with curd and scattered with berries before baking. The slicing and shaping is easy once you get the hang of it, and looks incredibly impressive. Moreover, this is one of the best things I have ever baked. There is just the right amount of sharpness from the filling to avoid cloying, with a beautiful tang from the lemon curd and berries, encircled in clouds of soft, fluffy dough. Just make sure you use some good curd; no radioactive jars here, please. Put the milk in a small saucepan and heat to body temperature, then remove from the heat. Stir in the sugar to dissolve, then add the yeast and stir well. Leave for around 10 minutes; it should become frothy and bubbly on the surface. Meanwhile, put the cinnamon, salt and flour into a large mixing bowl or the bowl of an electric mixer fitted with a dough hook. Make a well in the centre and crack in the eggs. When the yeasty milk has become bubbly, add it to the flour. Mix well with your hands or using the mixer until the dough comes together, then knead for 5-10 minutes until it becomes smooth and springy. It is quite a sticky dough, so you may need to add a little more flour to make it manageable. Return the dough to the bowl, cover with a tea towel and leave to rise until doubled in size – around 1-2 hours. When the dough has risen, divide it into two equal portions. Roll each piece out on a floured surface to a rectangle around 30cm x 45cm. 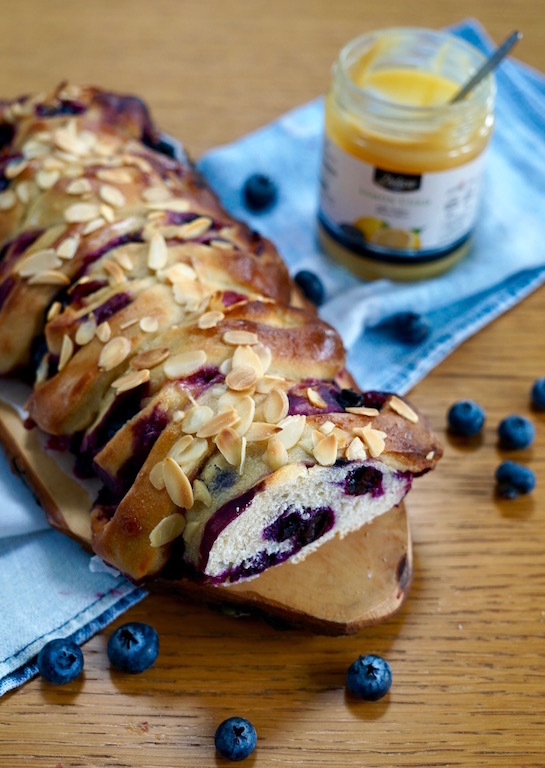 Spread the lemon curd evenly over each piece of dough, leaving a 1cm border around the edges, then scatter the blueberries evenly over the curd. Roll the dough up into a tight sausage, starting with the long side of the rectangle. Repeat with the other piece. Place the two sausages on two baking sheets lined with baking parchment. Using a pair of kitchen scissors, snip almost all the way down the dough sausages, widthways, at 2cm intervals. Push the resulting pieces alternately to the right and left, so that you end up with something that looks like a braid, or a series of cinnamon rolls next to each other. For a useful visual tutorial for shaping the bread, see here. Leave the loaves to rise for another 30 minutes. Preheat the oven to 200C. Brush the loaves with beaten egg and sprinkle with the flaked almonds. Bake for 20 minutes, or until risen and golden brown. Some of the curd will seep out of the bread onto the baking parchment; don’t worry about this, it’s inevitable and the resulting loaf will still be deliciously sweet and sticky. Leave to cool before eating. They also reheat well in an oven at 160C for 10 minutes or so.